I have squandered another perfectly good weekend. Well, maybe not squandered. I cooked, I cleaned. There were naps. There was laundry. I planted some grass seed, I planted three packets of morning glories, and I got myself some flowers for my room. I also watched a movie that I had seen before, but I think is something that is so timely, even though it is 61 years old, that it should be required viewing today. 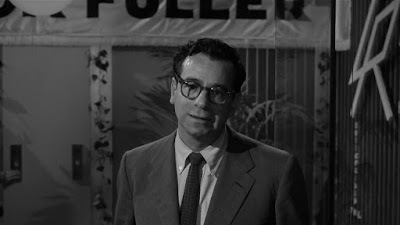 Elia Kazan's 1957 "A Face In The Crowd". If you hear the name Andy Griffith and think Sheriff Taylor or Matlock... well, you need to meet Lonesome Rhodes. It's a cutting look at the cult of personality. And how people need a voice, and they're willing to pick someone based on shock and not substance. It's as relevant today as it was in 1957. The cast is delightful - and one of my favorite roles is an understated little gem - Mel Miller - played by Walter Matthau. He's the smartest man in the room, and Lonesome hates him for it. The backstory is that Mel is Vanderbilt, Class of 1944, and that's how Lonesome refers to him. The first part of the movie takes place in Arkansas and Tennessee, then moves to New York. I'm not going to give you the plot of the whole movie - go watch it - but there's something about it that really hit me in the gut. I relate to Mel. I relate to Marcia, played by Patricia Neal. Something about it just gets to me. Go watch it. Really. I had the opportunity to see Matthau's grave in California. And Jack Lemmon's, and Billy Wilder's. I I have had some fun, haven't I? Anyway - it's been a good weekend, and I'm ready for what's next. I hope that your Passover was passable, your Easter was easy, and your Fool's Day was foolish. I'm going to try to get some sleep, see if I get my my sinus headache to peace out, and I am going to hit the ground running tomorrow.